The renovations are complete on our regular meeting location, and we are back to holding our monthly membership meetings at the Mennonite Church Auditorium in the heart of the Lake City business district. The church’s address is 3120 NE 125th St, Seattle 98125. Doors open at 6:30pm, and the meeting starts at 7:00pm. 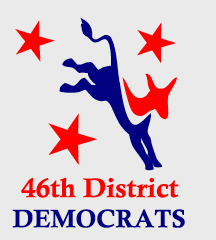 Minutes from the last meeting, the proposed resolution, and the agenda are on the website at 46dems.org. We will consider our 2018 budget, PCO appointments, and one resolution (regarding opposition to the Tacoma liquified natural gas facility). We'll also start the conversation on some specific bylaw amendments, which will be voted on in February. Our program will be on the redistricting process. What is right with Washington’s system, and what is wrong? When is a weirdly-shaped district not gerrymandering? How can we improve the process to make it more equitable and inclusive? Learn all of this and more on January 18th.